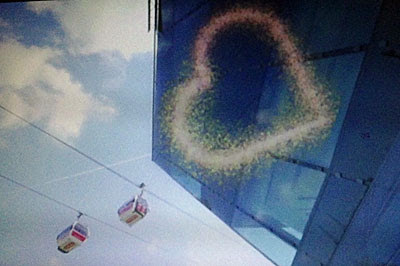 For ten minutes of romantic perfection this Valentinestide, a ride on the Dangleway is hard to beat. You've no doubt been tempted by the advert on the TfL homepage. 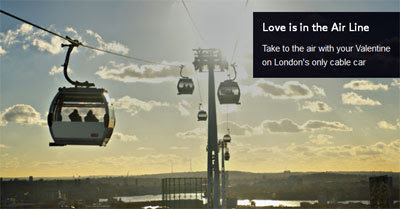 London only has one cablecar, so you really do have no choice but to take to the air. The service is running later in the evening this weekend (that's until 9pm last night and Sunday, and until 10pm on Friday and Valentine's Day itself) to give loved-up couples additional time to come aboard. At half past six the operator starts pumping romantic tunes into the terminals and cabins, and the scene is set for an emotional rollercoaster. Or that's the plan. Potential customers emerging up the escalator at North Greenwich tube are met by two staff at the specially decorated Dangleway kiosk. The front of the desk has been emblazoned with a special board showing the Air Line logo amid a sea of hearts, and of course everything's red which is perfectly on brand. Alas nobody seemed tempted by the display when I passed by, but perhaps they all had homes to go to. Over at the terminal you'd never guess that anything amorous was going on, there being not even a single red helium balloon as a hint of the weekend's temporary theme. 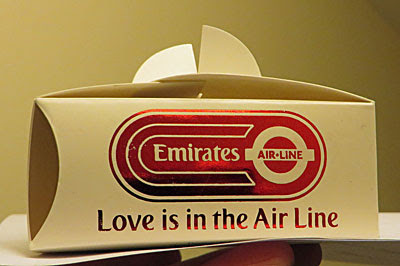 Indeed the first the unwitting customer would realise of the evening's activities is when the member of staff by the ticket barrier reaches into their cardboard carton and brings out a free box of chocolates. You don't even need to be a couple - I got one as a blatant singleton, which makes you wonder how many of these freebies they have to give away. Inside the box, once you've twisted the lid open, are two bijou Thorntons chocolates. I got a foil-wrapped almondy Diplomat and a Layered Chocolate Classic for my troubles, which I thought was very generous of TfL's marketing budget. Even better, I didn't have to share my free chocolates with anyone else, whereas anyone arriving with a partner faces only getting one each. Ah it's quite busy, I thought, once I was upstairs in the terminal. But no, everybody else was staff, including the steward who ushered me aboard and - at this time of the evening - four cleaners busy giving each pod's windows a wipe with squeegee bubbles. Soft music was playing over the tannoy, with a Steve Wright's Sunday Love Songs vibe, kicking off with Bruno Mars and Just The Way You Are before fading into a bit of Coldplay. And the romantic tunes continued inside the cabin, all the way across. To be fair they weren't too disruptive, not in the way the in-flight feature tour normally is, because that thankfully had been switched off. In its place was a five minute filmloop of East London sights, re-coloured and with hearts added electronically over the top. Occasionally two young people embraced, to set the appropriate mood, and then it was back to advertising the Orbit, the Crystal, and all the usual Air Line marketing suspects. Not having a partner with whom to enjoy the aerial seclusion, I amused myself by counting the number of passengers in every gondola that floated by in the opposite direction. And that was zero, repeatedly, until eventually another middle-aged single man floated by, and then another. The pattern was broken by a party of six, who I very much hope weren't engaging in anything amorous, and then a bright light heralded a lone cyclist accompanying his bike across the Thames. Eventually yes, there were some couples. One pair were sitting particularly close together - they'd clearly come for the Valentine's experience - while I'm not sure if the two gentlemen following behind were together or not. All in all nine of the 27 cabins I passed were occupied, four of these with couples, while two-thirds were completely empty. For this time of the evening, post commuter-rush, I suspect the resulting average of 'one passenger a minute' was relatively high. The final tune playing as I stepped off at the other terminal was Amy Winehouse's Love Is A Losing Game. I'm not sure who picked this for the playlist, because the lyrics aren't exactly bubbling over with positive emotional sentiment. And there was nothing romantic either about exiting through the ticket barrier, past the malfunctioning DLR departures board, and out into the empty Royal Docks. But hey, if you and your beloved fancy getting ten minutes of privacy this weekend, you know where to come.